Towards the end of summer last year, me and a friend of mine who kindly helped for a few days battle against brambles and ground elder, discovered a long lost and well hidden bee hive completely covered in a mass of thorns and nettles. We first noticed an increasing amount of flying furry things getting more and more agitated and then spotted a wooden box, which on further exposure, revealed itself as an old and somewhat bedraggled looking and very much active bee hive. Shocked and excited we cleared around the hive and carefully created a covering for it as protection from the coming winter. …an old piece of advice, but one which I paid attention to (just) as we moved the hive around 2m up close to the privet hedge and out of the way of the roadway. All winter I kept an eye on the hive for any signs of activity and prayed that we didn’t kill off or disturb the bees too much. Thankfully, now spring has finally arrived they bees are showing signs of activity and buzzing around the hive once more. I have been in contact with the local Bee Keeping Associated, who have been incredibly helpful. 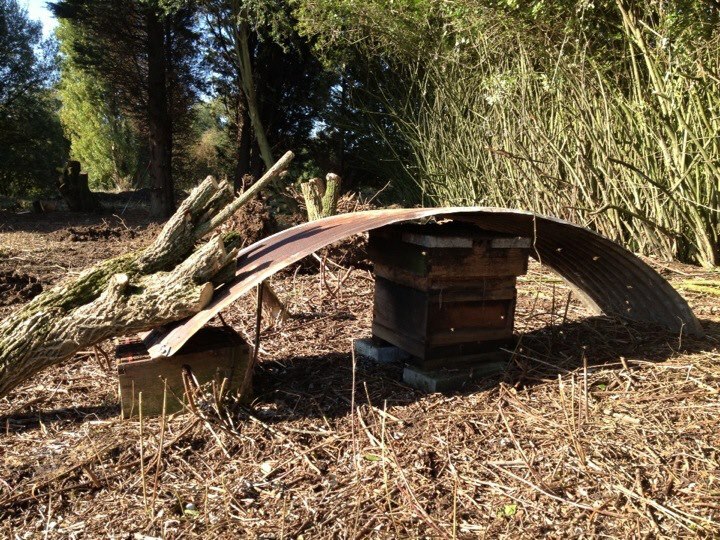 Fred, a member came and checked them out last week (10th April) and reported that although the hive itself is in great need of repair or replacement the colony was looking healthy and stable. We intend to buy at least another hive to re-home the bees and possible set up another couple. Has anyone out there who lives in the local area had experience in bee keeping or currently tends to a hive, we’d be glad of some advice or assistance if willing to help? I have had the pleasure of a visitation from Fred, a member of FERA – who kindly lent me a beekeepers suit and showed me inside the hive. After giving the entire structure a brisk clean and all the frames covered in honeycomb chambers a once over, he declared the hive fit for purpose. No disease and list of what to get and do, means a new extension for the bee population and some fascinating new experiences for me in looking after this precious part of the site. With any luck I may get enough metal recycling money to buy what’s needed. Just seen this. A year late but i keep bees in baston if you want any help with bees ? I certainly would like some help, yes please. It’s probably a good time of the year to check them out? Please call me on 07929778002 and we can arrange something.